The Portfolio (positions) window is an automated tool that tracks current positions and creates a log of the history of all positions for an account. 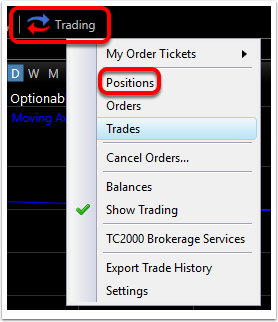 Click the Trading Menu and choose Positions to open the Positions Window. 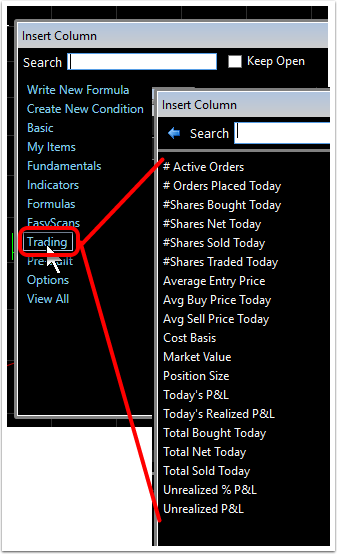 To view only current positions click the check mark next Positions at the top of the Positions window. 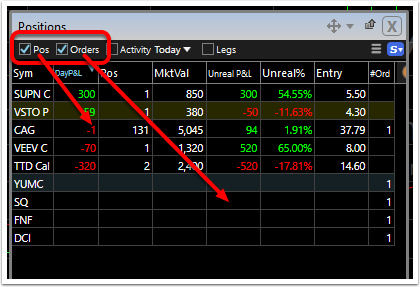 To view both current positions and pending orders click the check mark next both Positions and Orders at the top of the Positions window. Symbols with either current positions or acitve (pending) orders now both appear in the list. This is a convenient way to see all exposure to the market in one window. To see a history (log) of positions for up to three years, check the tickbox next to Today. 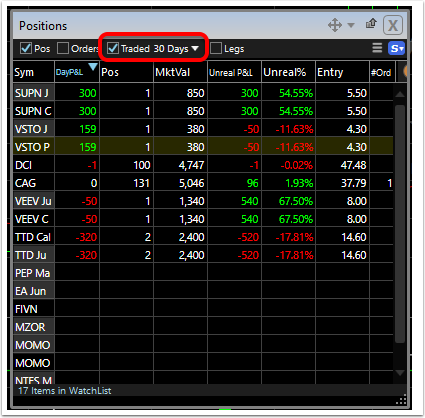 Click the drop down menu and choose a time span over which to view positions. Choose either activity (any trading acitivity) or Traded (actual trades that occurred). 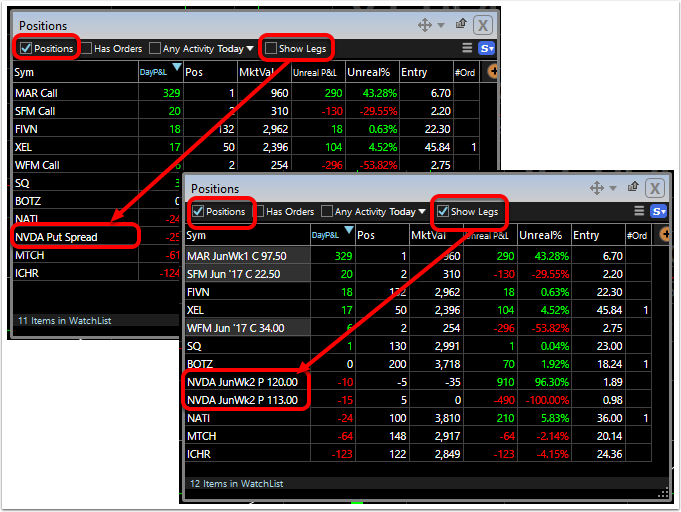 The window now displays all positions (all activity or only trading activity) for the selected time span (e.g. last 30 days). The normal view of multi-legged options in the Positions window is as a single position (e.g. Put Spreadas 1 position as opposed to 2 individual legs). 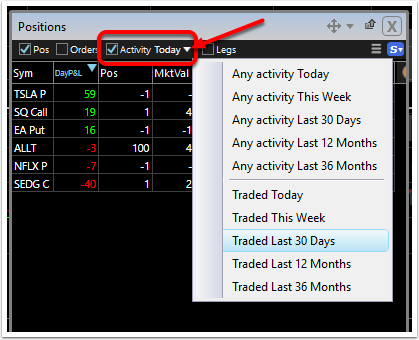 To view each of the legs of multi-legged options, check the tickbox next to Show Legs. 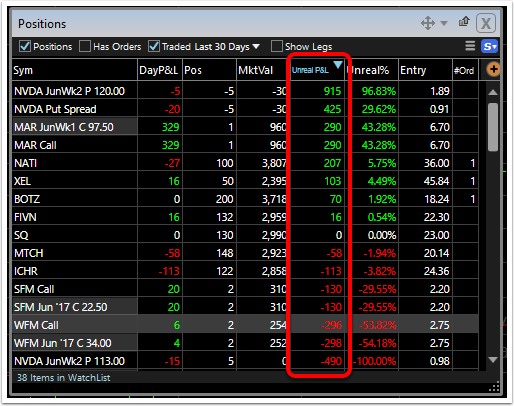 Note: the Positions window can contain both stock and options positions. Sort (rank) positions using any of the columns in the Positions window. 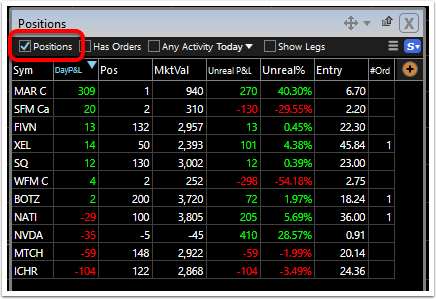 The exanple below sorts all positions in the account over the last 30 days by Unrealized P& L (net unrealized gains or losses on position to date). This ranks the orders from those with the largest potential gains to those with the largest potential losses. Click on any column header to sort by that column's data. The blue arrow in a column header indicates the sort column and in what order (ascending/descending) the list is sorted. Use the Search field to type a column name and pull it from any of the categories. Click on the desired column name to add it to the Positions window. Click Add Value Column to open the Library of available fields. 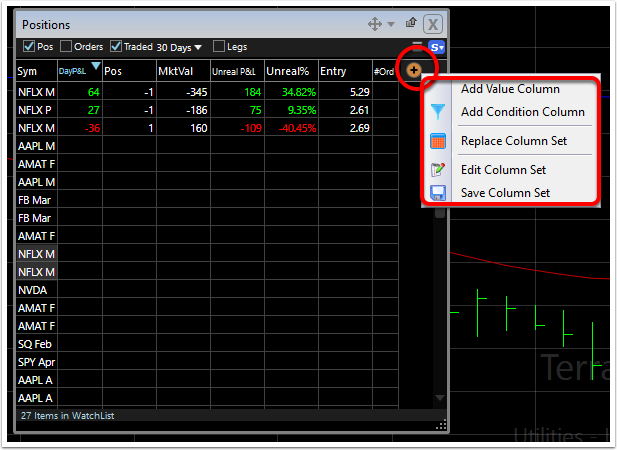 The Trading Section specifically contains column choices that apply directly to positions. Simply click on a selected item to add as a sortable column to the Positions window.